Please check back soon for more details on New Events. In the meantime, please contact us for more details. A young woman is left partially paralyzed after a mixture of cocaine and heroin. She is admitted to a local hospital rehabilitation department and provided with a wheelchair to get around the hospital. When she is ready to leave the medical environment, she is referred to an Independent Living Center. A couple is bewildered and frightened when they discover their newborn is deaf. Their pediatrician knows their concerns can be easily alleviated and refers then to an Independent Living Center. Having worked as a domestic most of her life, at the early age of sixty, a woman is severely affected by high blood pressure and diabetes. She needs medical attention and information on benefits that may be available to her. Where can she turn? The Independent Living Center. Harold dreams about opening a restaurant. He’s heard all about the American with Disabilities Act, and knows that it will impact on his business plans. How can he learn what he needs to comply with the law? By going to the local Independent Living Center. Staffed by trained professionals, some of whom are disabled and others who have first-hand experience dealing with individuals with disabilities, the Harlem Independent Living Center (HILC) is a non-profit organization serving the Greater Harlem area. HILC aids people with disabilities, particularly minorities with disabilities, their families and friends, by providing them with information and skills they need to live independently. HILC will focus on serving consumers who show signs of drug or alcohol abuse as a secondary disability. Services are provided using an “interactive peer” approach — staff members interact with individuals with disabilities, i.e. “consumers” by sharing their own experiences. Consumers are then encouraged to develop individualized plans tailored to meet their own socio-economic, medical, educational, vocational and recreational goals. HILC is open to people of all ages, races, sexual orientations, national origins and disabling conditions. Services are provided FREE of CHARGE with no strings attached – you do not have to be working or seeking work to qualify for services. Reaching the full potential of an accessible community. 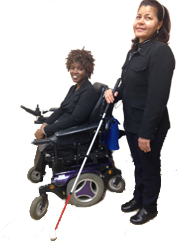 The Harlem Independent Living Center (HILC) assists the communities of people with disabilities in achieving optimal independence through culturally and linguistically appropriate services by advocating, educating, empowering and being a community change catalyst.